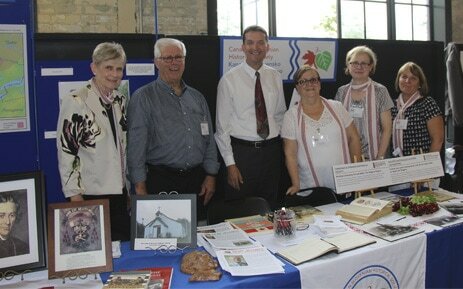 The CSHS was formed in 2002 and incorporated in 2003 to coordinate, research, record and preserve the history of Slovenians in Canada. CSHS has over 200 interesting audio interviews. 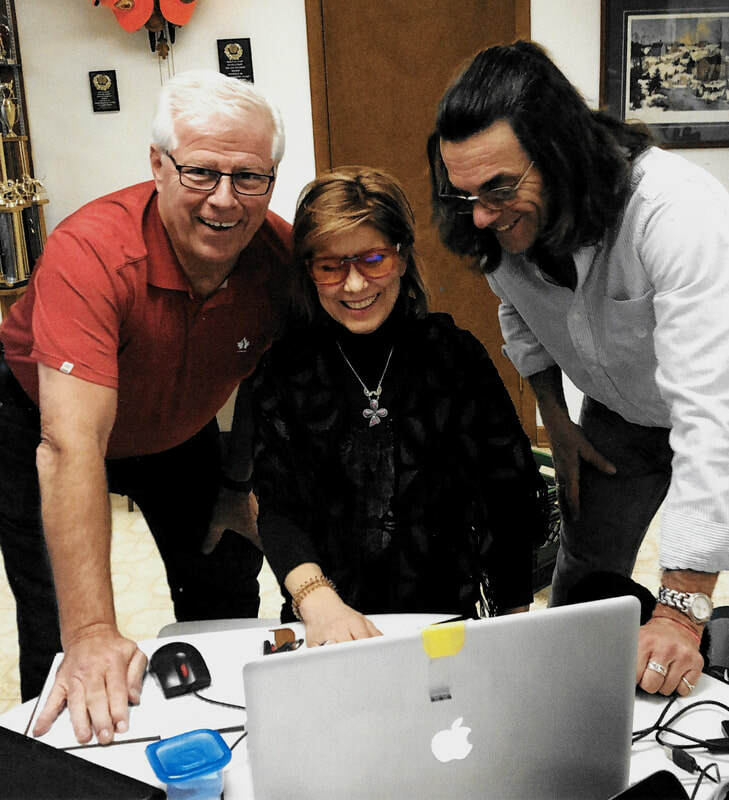 The seniors outline their life in Slovenia, the reason for coming to Canada and how they established themselves in Canada.This year we have started video interviews. Currently we have taped people from the golden horseshoe area in Ontario, but we would like to hear from our seniors across Canada. On Saturday February 9, 2019, the CSHS held it's 15th AGM in the auditorium at Dom Lipa. After the reports were presented, there were two bylaw changes approved. The term expired for four committee members. Jerry Ponikvar, one of the founding members, did not seek another term, The term also expired for Miriam Čekuta, Mario Ulcar and Anne Žagar. They accepted their roles for another term. Paula (Platnar) Petersen was introduced as a new candidate for the board. All four candidates were voted in by acclamation. Since Pamela Gosnach retired, Mark Ferkul was elected to complete her term. Upon conclusion of the well attended meeting, refreshments were served. The third annual luncheon was held on Sunday, January 20, 2018, at Our Lady of the Miraculous Medal Church Hall. 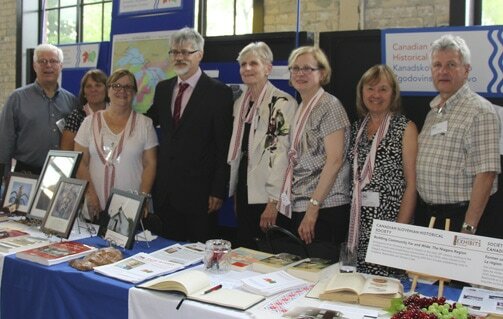 The display table was populated with many photographs and documents of a historical nature, highlighting Canadian Slovenian activities throughout the years. Emily Chicorli, our archivist answered questions and encouraged people to have a look and see if they can identify any of the people in the photos. In the kitchen, Maria Soršak and her crew prepared three different types of meals: chicken schnitzel, roast pork and golaž. Despite the cold and snowy weather, there was a large turnout. Thank you for supporting us again this year. On August 8, 2018 a monument was unveiled at the location where Captain John's Restaurant used to be docked. The monument includes the anchor from the ship Jadran. The event was coordinated by Joe Mihevc, city of Toronto councilor, and his office. In attendance were also the former mayor of Mississauga, Hazel McCallion, and former mayor of Toronto, David Crombie. All three spoke eloquently and supportively about John Letnik's vision of the waterfront and his contribution to the city of Toronto. 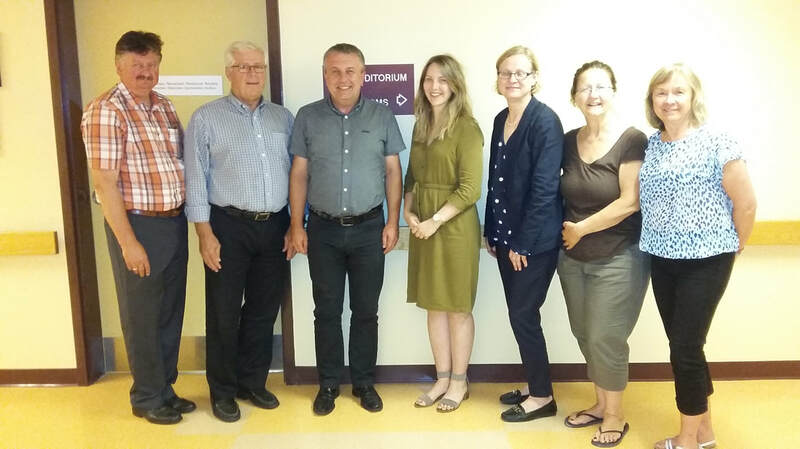 On Wednesday July 12, 2017 members of the Canadian Slovenian Historical Society (CSHS) and the Vse Slovenski Kulturni Odbor (VSKO) had the pleasure of meeting Dr. Bojan Cvelfar, Director at the Archives of the Republic of Slovenia in Ljubljana. Members gave Dr. Cvelfar a tour of the CSHS Archives in Dom Lipa and discussed archives, traditions, and communities in Canada and Slovenia. Dr. Cvelfar was in Toronto along with three other archivists from Ljubljana and Maribor for the 2017 Archival Education Research Institute (AERI) Conference held at the University of Toronto. (From left to right): Marjan Kolaric, Marjan Ulcar, Dr. Bojan Cvelfar, Emily Chicorli, Mary Rozmanc, Vera Margutsch, Anne Zagar. ​All the issues of our quarterly newsletter OUR STORY can be viewed under PUBLICATIONs. The recent issue of OUR STORY (Winter 2018) can be viewed by clicking the button. The website continues to be updated as information and pictures become available. The GALLERY section is very informative as it provides a brief summary and pictures of what happened during each era. We are looking for pictures of early days in Canada, such as depictions of one’s first job, completing the work contract, the start of various Slovenian organizations, etc. When submitting pictures of parents and grandparents from years ago, please provide some commentary to enable better understanding and perspective. On November 27, 2018, Jerry Ponikvar was one of four people receiving the highest honour, the Award of Merit for Distinguished Service to Catholic Education. He served as Director of Education for the HWCDSB from 1990 to 1995, providing strong, faith-filled leadership during a time of significant financial restraint and program and facility growth. He not only introduced a number of important initiatives, including the Board’s internship program, the annual parent conference and the establishment of the board’s mission/vision statements, but was involved in the opening of several new elementary and secondary schools. Following his retirement from the HWCDSB, Jerry served on the EQAO Board of Directors and was a founding member of the Permanent Diaconate Diocesan Coordinating Committee and Serra Club. To celebrate Canada’s 150th anniversary, one of the government’s initiatives was to invite the various embassies to showcase their countries and culture. Friday, June 23 was Slovenia’s day, and the Embassy of the Republic of Slovenia welcomed various Slovenian groups and organizations from across Canada, who proudly presented Slovenia in dance, song and food, and by displaying cultural artifacts. The CSHS was pleased to be a participant as well. The event took place in the Horticulture Building at Lansdowne Park in Ottawa.